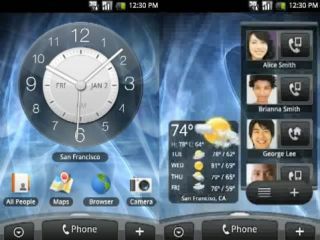 HTC Hero - the next Android skin? Those of you that look at the iconic Android clock on your T-Mobile G1 or the HTC Magic and think: 'that's so 2008', get ready to pick up the uber-skinned HTC Hero ROM instead. The clever chaps over at the XDA developers forum have managed to put together a working port that makes your current, bog-standard Android device into a next generation behemoth. Well, that is until the HTC Hero actually hits the shops in the not-too-distant-future, complete with super widget gallery and some kind of space-age buttons that might make you feel like you're aboard some intergalactic space ship. Or not, your call. The only problem is you'll need to be a pretty clued-up developer / code wrangler to get this thing on your phone - we're talking flashing the device, connecting up the debugger, the works. So if you've only just committed to an HTC Magic for two years on £40-odd a month, you might want to think twice before breaking it through your ham-fisted porting efforts. But on the plus side, the leak means it's unlikely we'll have to wait too long for the HTC Hero, so you can at least upgrade to the latest version of the Android gang if you're lumbered with nothing more than a shiny white brick.